**This Peeps Bunnies Easter Cake post was originally written as part of a sponsored campaign. I was compensated by Peeps for my honest review and creation. For more information on Peeps Products, please visit, Peeps and Company, here. Pink shiny bunnies and yellow glittery chicks, these sugary, marshmallow heavenly creations are my earliest Easter memories as a child. Between my parents, who filled Easter baskets (yes plural) with all sorts of candies and my grandparents, too. All these baskets contained so many differing candies, including jelly beans, homemade chocolate bunnies in milk and white chocolate and last, but certainly not least Peeps! Peeps and More Peeps, Oh My!!! Yes, Peeps were huge in our house and every Easter they were a staple in my baskets that were given to me as a kid. I will never forget how my grandfather (my dad’s dad) would actually somehow have them decorated around my basket handle. He would actually tape them and have them dangle. He was truly artistic and my basket would always look like it belonged in a fancy upscale candy store. And the Peeps were the perfect decoration. That said, I want to make Easter just as special for my girls and need to come up with some awesome creations. I don’t just want to do the traditional baskets though. So, I came up with a fun and colorful Peeps Bunnies Easter Cake. 1. Prepare the cake according to the directions on the box. 2. Pre-heat the oven to 350° F.
3. Once the cake is mixed (I use my KitchenAid Mixer on low setting), then transfer it into two 8” Round Cake pans equally). 4. Bake these two cakes for 35-38 minutes in the oven. 5. Let cool completely (about half hour) before removing them from the pan one at a time. 6. Ice the bottom layer first and then place the second layer on top, finishing icing the cake. 7. Then place M&M’s on the top of the cake. 8. Next, put Peeps aound the outside rim of the iced cake. 9. Now you are ready to serve. Once the cake is mixed (I use my KitchenAid Mixer on low setting), then transfer it into two 8” Round Cake pans equally). Bake these two cakes for 35-38 minutes in the oven. Let cool completely (about half hour) before removing them from the pan one at a time. Ice the bottom layer first and then place the second layer on top, finishing icing the cake. Then place M&M’s on the top of the cake. Next, put Peeps aound the outside rim of the iced cake. By the way, Peeps aren’t just for Easter anymore and this Peeps Bunnies Easter Cake recipe can truly be used and adapted for anytime of the year. Enjoy!!! I have been wanting to do the peep cake!!!! I saw it a few months ago. I'm glad I saw your cake as a reminder. Great job on all of your peep projects. I will have to try them all this year!!!! Great job……running to Target to buy peeps!!!!!! Thanks Clark and yes Easter is in only a few short weeks now, believe it or not!!! OMG. That cake! I think I gained 300 lbs just by looking at it!!! The M&Ms are a nice touch! Looks delicious! A brilliant post Janine and you have been so busy. I loved this one and am sharing all over. I've never been a fan of Peeps, but my marshmallow and sugar loving 5yo gets the BEST wide-eyed expression on her face when she sees them at the store. Thanks Lanaya and the cake was truly so easy to make. Emma like I said had a blast making it and she loved the colors!! I am so making this one again for Easter for us, because it was delicious and looked so colorful, too!! 🙂 I am telling you that you won;t be sorry if you make this for Easter for Reagan!! 🙂 xoxo!! Lol, Julie. I am so with Andrew on this and love Peeps, but Kevin could take them or leave them. That said we do have a nice stash now and of course I am doing Slim by the Summer, but cannot resist these Peeps. They are just too good and I am a total sugar addict. Hell, I was 8 months pregnant with Emma eating pixie sticks!! I love the cake design. I have even made the nests before… they were a disaster! Yours look much better! I love peeps. I even found the peep easter baskets so I got them for my kids. My favorite memory of Easter! Okay so I loooove m&ms and the recipes here! Going to be coming back for sure, when Easter is a bit closer. Hugs! And I entered the contest too, awesome! Oh my god you are NOT helping me with my sweet-tooth addiction. I LOVE Peeps…and now, I will be craving them something fierce. FIERCE, I tell ya! LOL…wonderful stuff here! Awesome, awesome post! I think my teeth hurt from this but I love the cake. if I hate baking, can I just have you come do this masterpiece for me? Please? Wow! I'm having my coffee and it's not even 7am yet, and all I can think of eating for breakfast now is that cake. It looks so good! These recipes are great! What a fun way to celebrate Easter…something different. My mom used to make us chocolate rice crispi treats. They were the best! Never thought of making plain ones….they look yummy too. Wow this has got me sooo excited for Easter. I'm obsessed with Peeps and have to make one of these yummy desserts. They all look pretty easy but I think the rice Krispy nests are too cute. Whewy! Yum! I so want to make that cake, so I hope I win the peeps!!! 🙂 Sorry I am a few days behind in my blog reading. Sick baby, doctors office, and other insanity! I've missed you! 🙂 Love this post! Oh no worries and hope your baby is Ok. Wishing you luck now!!! And I missed you, too!! That cake looks so cute! It is so spring-y! I'm a huge Peeps fan and I would love to win! That cake is gorgeous! I'm not entering, though the contest is nice (we're not big candy fans 😉 ). I just wanted to tell you how great that cake looks to me. Yum! Oh I love the cake! I might bring it to Easter dinner! Thanks for the great idea! This is by far the cutest candy cake I've ever seen! And it was featured today on Inspiration In Progress! 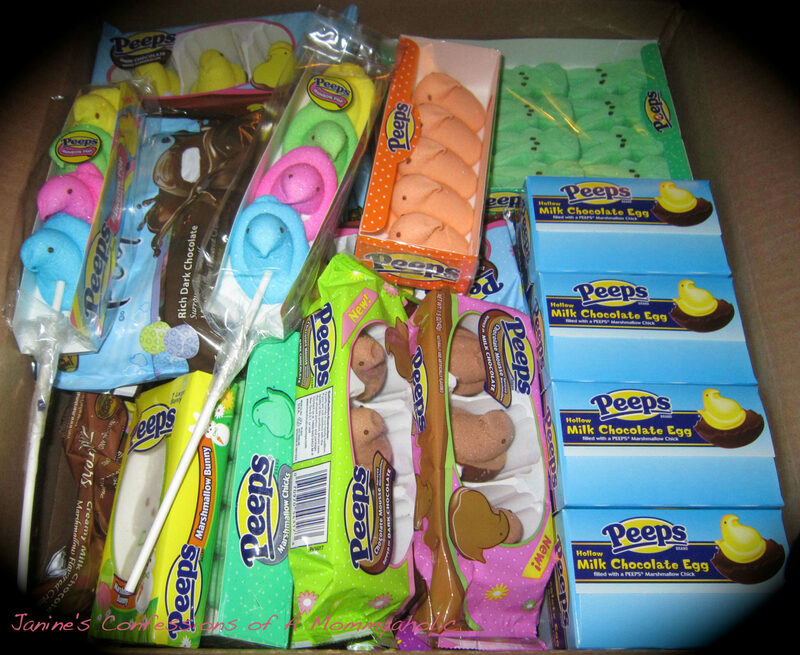 PS – I just bought all my peeps. I am making this cake next week!!!! Wow, I never knew there were so many great recipes with Peeps! They have never been my favorite candy, but used as a decoration – I could change my mind! I found you from the Pin It Tuesday Party and am now pinning this. I would love it if you would share this at my In and Out of the Kitchen link party. I know everyone would love to see it! you know I love this one!!! I just know that any kid, big or little, would love this cake! Thank you for sharing at the In and Out of the Kitchen Link party I can't wait to see what you bring next week! So cute!! Peeps aren't my thing, but hubby loves them. The kids, of course, like almost any kind of sugar!! Peeptastic. Thanks for the reminder of how creative you can be with this simple treat. Enjoy your SITS Day. The peep cake is my favorite! I never thought to use them as a border around your cake. So pretty, especially with the alternating colors. Those are some GREAT ideas! Now, the last one with the covered bunnies…that's a little creep-o, but I'm gonna do the cake one…cuz there's not enough sugar IN the cake. This cake is so bright and cheerful. It would be the hit at any Easter party. I love it and pinned it. Thank you for linking up at Saturday Dishes Cakes & Party Ideas blog hop. That has to be one of the cutest cakes ever! My pastor’s wife is addicted to Peeps, so I’ll definitely have to share these recipes with her! Pinning. Thanks for sharing at Saturday Dishes! Hope to see you back this weekend with some asian recipes! If you get a chance, please send me a copy of this cute Easter cake so I can feature it this week. I love these peep treats! The cake is awesome! I'm glad I found this on Coffee With Us 3's recipe linky! I hope you are having a good week. I am going to feature your Easter Peeps Cake this week on my Easter RoundUp. Omg, I would love to go to that festival!! Unfortunately, that amount of sugar and dye would have Minions completely unhinged. Yes, my kids are the unlucky ones that go completely rangy with that sort of thing. Can’t wait to check these out! Love me some Peeps! I’ll admit, peeps kinda freak me out. Looks like we were on the same page today, LOVE those m&m’s! My kids and sugar can totally be an interesting combo, too! I tried to yum this, but as it is a roundup yummly only put it in my private recipe box instead of the public queue. I did pin it though. Thanks for sharing! Thanks Marilyn and that is weird, because it isn’t a roundup, but my own three recipes for Peeps. Such a cute cake. I just yummed and pinned this! I love this cake more every time I see it! Thank you for sharing this delicious recipe at The Recipe Sharing Pin and Yum Party! I hope to see you next week. Pinned and Yummed. Please visit Thursday Favorite Things for more sharing fun!